Jack Can Really Ring A Bell! It’s that time of year! The holiday season is in full swing! Entertaining, baking, decorating, shopping…we love it all! And just as synonymous with the holidays as candy canes and Christmas carols, there is the Salvation Army’s Red Kettle Campaign. I’m sure that on one of your trips to the shopping mall, you’ve seen a red kettle stationed outside the door. Hopefully you’ve been able to drop in some change or a few dollars to help those in need, given a smile to the frozen, red-nosed volunteer who is cheerfully ringing their bell and been on your merry way. But this year, we’ve all been given the chance to do just a little more! 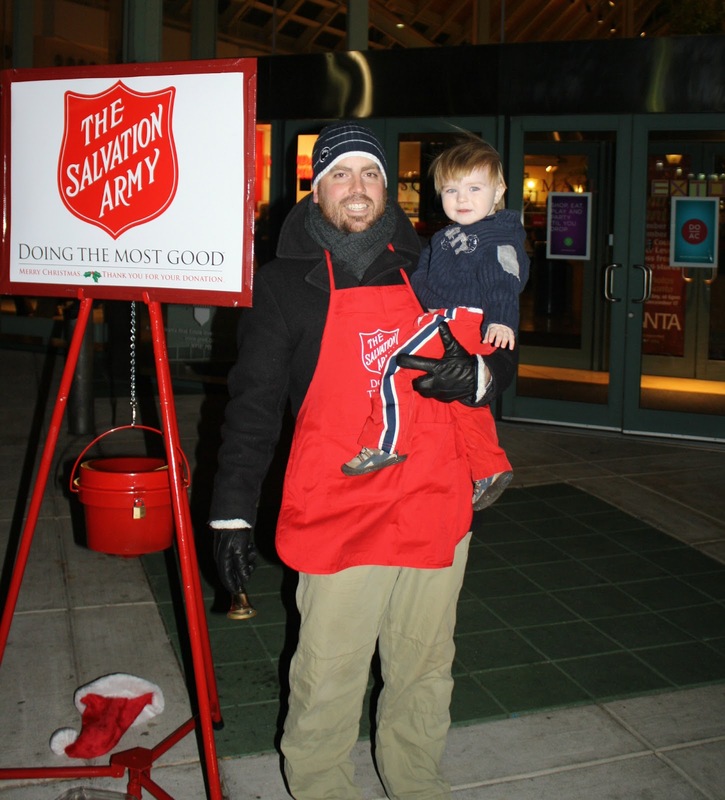 Your local Salvation Army is looking for volunteers to man their red kettles during the 2012 campaign which kicked off the week before Thanksgiving and runs through December 24th. Now in its 122nd year, this campaign has an incredible, grassroots history. In 1891, Salvation Army Captain Joseph McFee was distraught because so many poor individuals in San Francisco were going hungry. During the holiday season, he resolved to provide a free Christmas dinner for the destitute and poverty-stricken. He only had one major hurdle to overcome — funding the project. He remembered his days as a sailor in Liverpool, England and at Stage Landing where the boats came in, there was a large, iron kettle called “Simpson’s Pot” into which passers-by tossed a coin or two to help the poor. The next day Captain McFee placed a similar pot at the Oakland Ferry Landing at the foot of Market Street. Beside the pot, he placed a sign that read, “Keep the Pot Boiling.” He soon had the money to see that the needy people were properly fed at Christmas. Today in the U.S., The Salvation Army assists more than four-and-a-half million people during the Thanksgiving and Christmas time periods. Captain McFee’s kettle idea launched a tradition that has spread not only throughout the United States, but all across the world. Kettles are now used in such distant lands as Korea, Japan, Chile and many European countries. Everywhere, public contributions to Salvation Army kettles enable the organization to continue its year-round efforts at helping those who would otherwise be forgotten. When I heard about this opportunity, we were eager to volunteer. Not only to be a part of the rich history of such a worthy organization but two hours at the mall with my husband and toddler sounded like a great date night to me! From beginning to end, it was one of the easiest, most enjoyable volunteer experiences we’ve had. Step 1: Call your local Salvation Army to sign up. The Salvation Army’s website (www.salvationarmyusa.org) can help you find the location closest to you. We called the West Chester Corps (610-696-8746) where Donna Copeland, Program Director, was happy to help assign us a shift. With four red kettle locations in Exton and two in West Chester, it was easy to find a date and time that worked with our schedule. Step 2: Show up for your shift. We even received a phone call that morning to confirm our time slot. We arrived a few minutes before we were scheduled to begin, met the friendly volunteer working before us (who volunteers 12 hours a day, all 31 days of the campaign…now that’s dedication!) to hand off the bell, apron and candy canes. Step 3: Ring the bell. We chose to work at the Exton Mall Food Court which was a very family-friendly place to be. 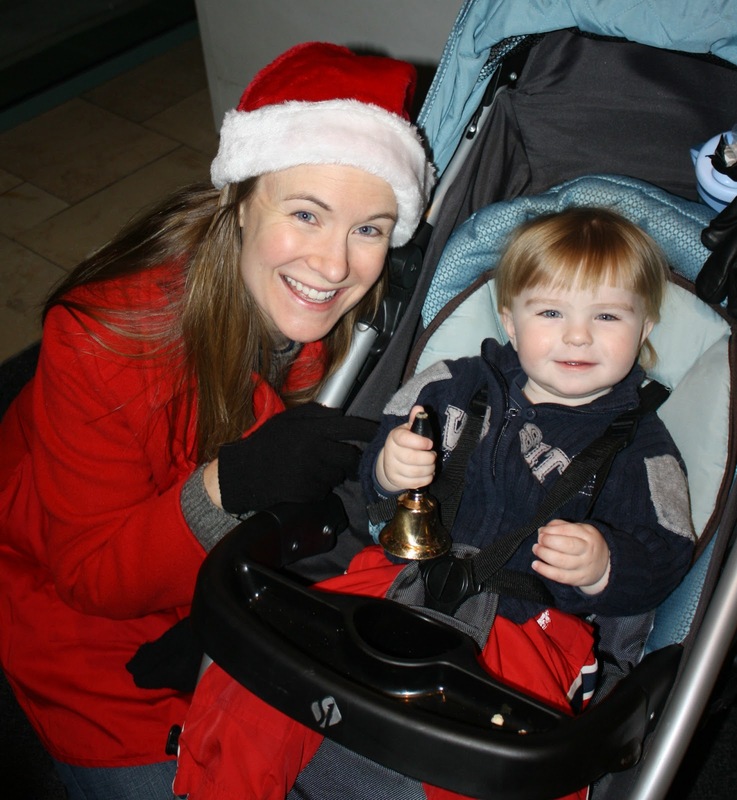 Jack had so much fun entertaining the crowd as he rang the bell and danced around. And when it was toddler break-time, my husband and I took turns keeping watch of the kettle. The two hours went by in a flash. We worked the last slot of the day which made me a little nervous because we had to make sure the kettle was picked up by the staff before we could go home. But right on time, an official Salvation Army van pulled up and in swat team fashion, the staff members jumped out and quickly broke down our station and we were ready to head home. And now for the question you’ve been wanting to ask the entire time you’ve been reading our blog (and the question almost every single person we met during our bell ringing experience asked us)…weren’t we cold?!?! Of course! It’s winter in PA! And we just happened to choose an evening shift over the Thanksgiving weekend where the high temperature that day was a balmy 40 degrees. But being outside for our short two hours made me think about the over half a million homeless people in the United States who are living in the cold this time of year. And why it’s so important to help organizations like the Salvation Army, especially during the holidays, who are providing things such as shelter, food and the basic needs that so many of us can easily take for granted. So just bundle up, keep a hot beverage of choice in hand and enjoy the warm and fuzzy feeling you’ll get knowing you’re helping provide comfort and hope to those in need.